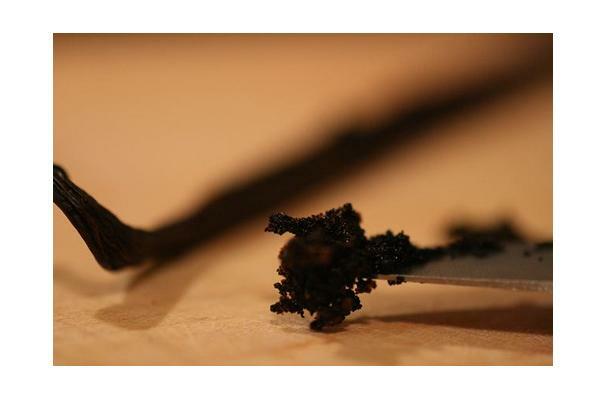 The vanilla bean is long, slender and dark brown. Inside the bean there are hundreds of tiny seeds which contain the flavor. It is one of the most commonly used spices in sweet foods, baking, candy, and as a flavoring for coffee. It is very aromatic, and although it is primarily associated with sweet foods it can also be used as a savory flavoring. Choosing: Choose whole beans, bourbon variety (just a name, not regional, some of the best grow in Mexico), with no cracks or tears where the tiny seeds might fall out during use. Procuring: Vanilla beans are the fruit of certain orchids which are notoriously difficult to cultivate. Use the whole beans to infuse sauces, water, alcohol or other liquid. Heating speeds the infusion process dramatically, but is not advisable with alcohol. The beans can be reused indefinitely, so long as the seeds are not removed from the pod. For rich, specialty dishes like creme anglais, cut the pod open and scrape all of the seeds into the milk. Cleaning: After use, rinse thoroughly and allow to dry completely before returning to pantry. Keeps for a very long time and can be reused many, many times without diminishing results. Keep bone dry, stored in a cool pantry or cupboard.